Several EF5 tornadoes have thrown industrial equipment weighing in excess of 15,000 lbs long distances. At top left, the 2011 El Reno tornado hurled an oil tanker weighing approximately 25,000 lbs a mile without leaving any noticeable ground impacts. At top right, the 1970 Lubbock tornado tossed a 26,000 lb fertilizer tank 3/4 of a mile over a freeway and several undamaged fences. At bottom left, the 2011 Tuscaloosa tornado hurled a train car weighing 71,600lbs 130 yards in one throw, according to witnesses. 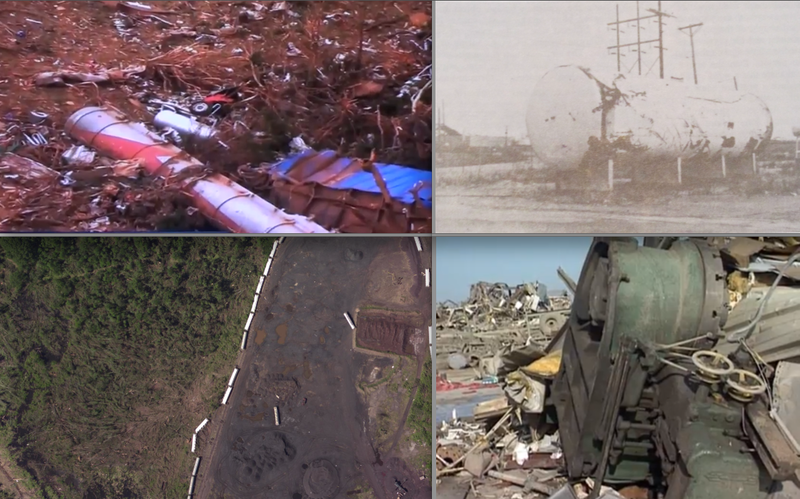 At bottom right, the 1995 Pampa tornado lifted a 35,000 lb lathe. □ Accurate tornado statistics can be difficult to find. Recording techniques were not standardized before the weather radar age, so information on tornadoes that occurred before 1970 is often unreliable. Furthermore, lists of the deadliest and longest tracked tornadoes in world history are easy to find and dominated by 19th and early-20th century events. To level the playing field and promote the dissemination of credible information, all of the following records cover tornadoes that occurred after 1970. Click each link in the index below to jump to a specific section. This page will undoubtably go through several edits and expand as more notable tornado records are uncovered. The 2011 Joplin tornado was by far the deadliest tornado of the past 50 years. Considering the storm’s incredible intensity and size, it is remarkable the number of deaths did not surpass 200. All three of the deadliest tornadoes since 1970 occurred during the 2011 tornado season, the worst in modern history. □ A violent EF5 tornado rapidly intensified as it entered heavily populated sections of Joplin. The storm holds the post-1970 record for the most fatalities in frame homes (approximately 70) and the most fatalities in commercial buildings (approximately 20). The commercial deaths do not include the large number of fatalities at medical facilities, churches and private organizations. □ One of the most impressive tornadic events in history carved a 132-mile path of devastation through largely rural areas of northern Alabama. The EF5 tornado had an exceptionally high fatality to injury ratio. The storm holds the post-1970 record for the longest swath of EF5 damage (including approximately 40 consecutive miles at EF5 intensity). □ Borderline EF5 tornado caused more than 40 deaths in Tuscaloosa. Extremely well-covered by local news agencies and photographers. Caused high-end EF4 damage from Tuscaloosa to the suburbs of Birmingham. □ A fast-moving F4 tornado nearly wiped out the town of Pugh City, killing 22 residents. Dozens of small homes were swept completely away. Official death toll of 58 is likely the result of a tornado family. □ A large tornado left a wide swath of marginal F4 damage in Wichita Falls. The historic storm holds the post-1970 record for the greatest number of fatalities in vehicles (25). The majority of the deaths in automobiles were people attempting to flee the storm. □ A fast-moving F5 tornado passed directly through the town of Inverness, killing approximately 20 residents. Most of the deaths were in poorly built homes that were obliterated. □ Violent F5 tornado killed 13 people in rural areas while at maximum intensity. The storm then caused another 23 deaths as it tracked through the Oklahoma City suburbs. Holds record for the highest doppler velocity ever measured – approximately 302mph. □ Marginal F5 tornado caused a high number of fatalities as it chewed through small towns near Birmingham after dark. The worst damage was confined to several small streaks of intense devastation. □ Infamous multi-vortex tornado became the deadliest and most damaging single storm in the 1974 Super Outbreak. Brief film of the tornado captured by a high school student was broadcast on news networks across the world. □ Violent F5 tornado swept away well-constructed houses in the town of Brandenburg. 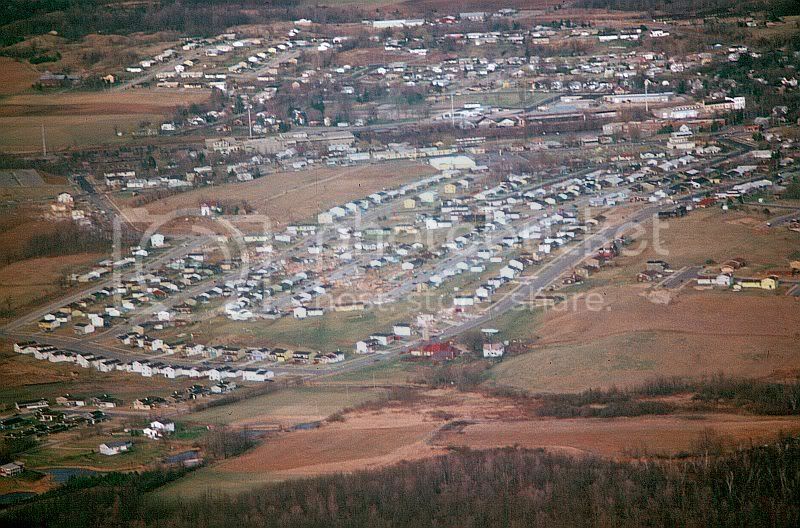 The storm struck far fewer homes than the Xenia tornado yet caused a similar death toll due to its extreme intensity. □ Short lived multi-vortex tornado touched down and rapidly intensified as it passed over a small town in southwest Texas. Most of the fatalities occurred in the destruction of a crowded church. -Due to the high number of tornado families that have been officially recorded as a single storm, an accurate list is difficult to compile. Tornadoes thought to have been two or more separate storms are not included. This list will undoubtably go through various edits. The longest tracked tornadoes generally occur in the South in the spring and fall when upper-level winds are more conductive to rapid forward movement. 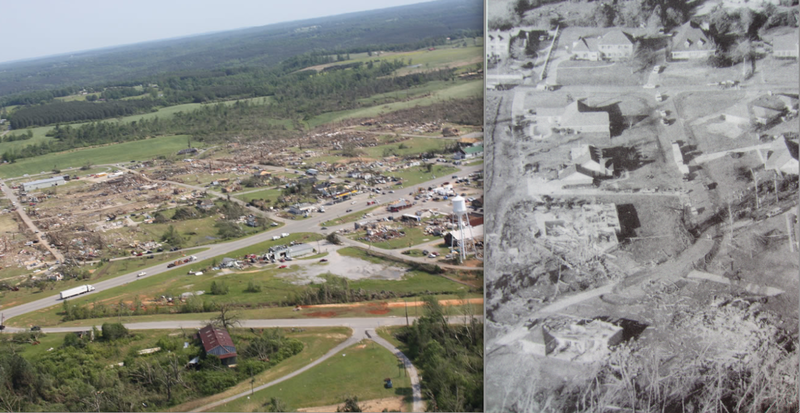 At left, one of the longest tracked tornadoes in history caused EF5 damage in Hackleburg. At right, an extremely long-lived nighttime tornado killed four people in the obliterated home at bottom near Jackson, Mississippi, in 1992. The body of one of the occupants was found in a tree a quarter mile from the foundation (Grazulis, 1997). □ A large, often obscured tornado sped through central Mississippi, killing 10 people in and near Yazoo City. The majority of the damage path was through sparsely populated forestland. □ Violent EF5 tornado travelled across nearly all of northern Alabama, causing 72 deaths before crossing the Tennessee border and continuing for an additional ten miles through Franklin County. The storm left strong tornado damage (EF3+) over more than 110 miles (NWS Survey). □ Violent, rain-wrapped tornado killed 12 near Jackson around midnight. Four of the deaths occurred when a large, two-story brick home in the Easthaven subdivision was completely destroyed. □ Fast-moving tornado killed 13 people in Alabama. While officially rated an EF4, the tornado left severe ground scouring in unpopulated areas and hurled a vehicle nearly one mile. □ A Lesser know violent tornado during the 2011 Super Outbreak killed 7 in Mississippi and Alabama. Formed farther south than most of the tornadoes on April 27 and left a quarter-mile wide swath of fallen trees through a forest reserve. □ A fast-moving and long duration EF4 tornado ripped through largely rural areas of Arkansas. The 13 fatalities were spread out over a 30 mile area beginning in Pope County. -Due to their rapidly shifting nature, it is difficult to ascertain the forward speed of a tornado over a specified time period. Decaying tornadoes can momentarily exceed 90mph, but these great speeds are never maintained. Most of the fastest tornadoes occur in the South from late-November through April, but similar conditions can cause extremely fast moving tornadoes from Tennessee to Michigan. Many of the tornadoes in the 2011 Super Outbreak reached speeds of 70mph at some point in their development. Examples include the Hackleburg/Phil Campbell tornado as it ripped through Marion and Franklin Counties and the Smithville, Mississippi, tornado as it caused some of the most intense EF5 damage ever photographed in Monroe County. The deadliest tornado outbreak of 2012 brought violent and fast-moving tornadoes to the states of Indiana and Kentucky. The deadliest two tornadoes in the outbreak – the Henryville, Indiana, tornado and the West Liberty, Kentucky, tornado – may have approached 75mph in periods of their development. During the 1974 Super Outbreak, nearly every supercell was moving in excess of 50mph. The violent tornadoes that occurred in the state of Alabama – including the infamous Guin tornado – may have reached or momentarily surpassed 75mph. One of the most unusual tornadoes in recorded history touched down high in the mountains near Yellowstone National Park on July 21, 1987. The rain-wrapped tornado, which travelled at nearly 60mph, was imbedded within an exceptionally violent mesocyclone that contained large hail and frequent microbursts. 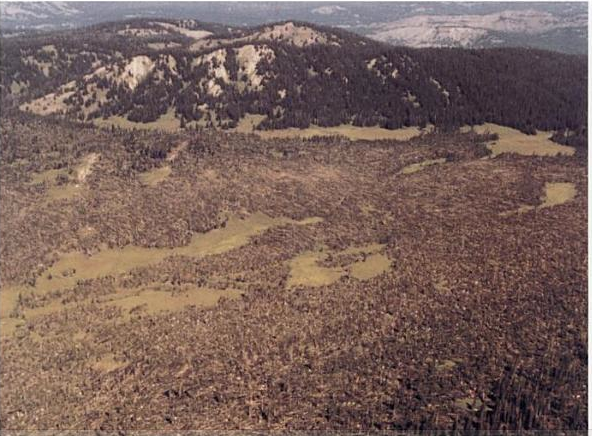 Fujita toured the 1.5 mile wide damage swath and noted bursts of extreme tree damage consistent with violent (F4/F5) tornadic winds more than 9,000ft above sea level (the worst damage is visible as the lighter area on the hillside just above center). Some mountain peaks affected by the storm were at an altitude of nearly 11,000ft (Fujita, 1989). The rare storm, which was likely capable of causing a wide swath of EF2, EF3 and EF4 damage early in its life, proved that potentially catastrophic tornadoes can occur well-outside “tornado alley.” Had the storm impacted a large population center, it could have caused damage and loss of life comparable to the 2011 Joplin tornado. In October of 1964, Hurricane Hilda made landfall in Louisiana as a weakening Category 3 storm. Before the hurricane’s eye reached the coast, a violent tornado was spawned 30 miles south of New Orleans in a marshy area near the Gulf of Mexico. 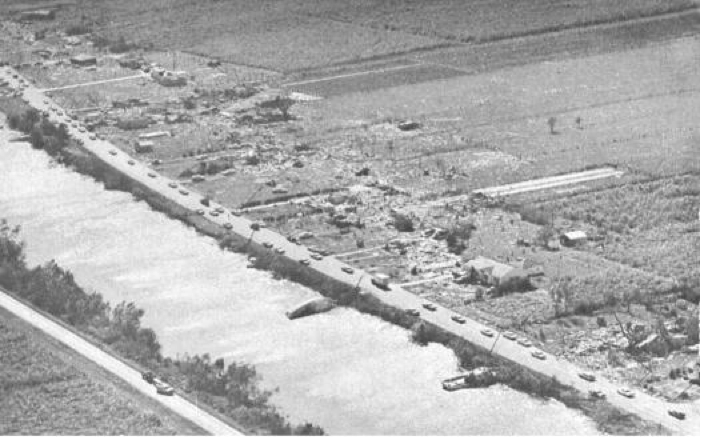 The F4 tornado travelled westward over a narrow strip of homes and buildings that lined a waterway in the town of Larose, killing 22 residents. Some homes were swept completely away and many of the bodies were carried more than 100 yards and later recovered in a nearby bayou. The storm remains the deadliest hurricane spawned tornado in US history and one of the strongest such storms ever recorded. On May 27, 1997, perhaps the most violent tornado in modern history passed over two clusters of homes just outside Jarrell, Texas. 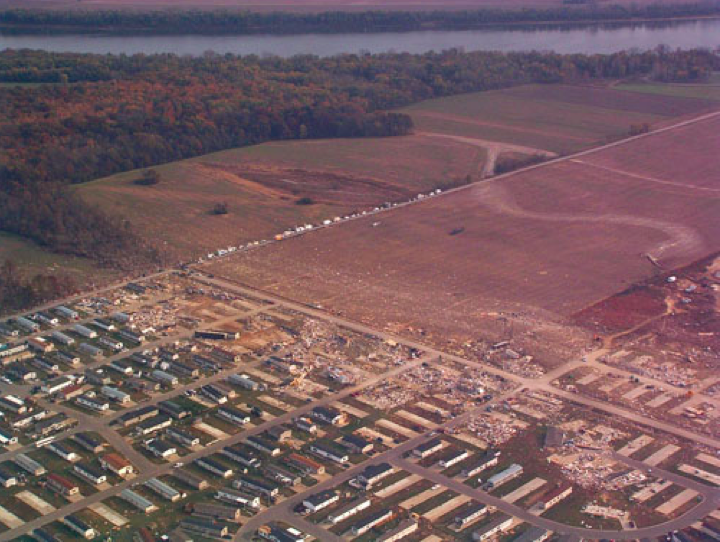 The slow-moving F5 tornado completely swept away two dozen homes and ground the debris into tiny pieces. Within the streak of worst damage, which expanded over a quarter-mile in width, there were no survivors above ground. All of the vegetation in the worst affected areas was scoured from the ground, leaving nothing but empty foundations and fields of mud. At left, the 1987 Saragosa, Texas, tornado killed 22 people in the Guadelupe Church during a graduation ceremony for young students. At center, the 1994 Piedmont, Alabama, tornado killed 20 parishioners at the Goshen United Methodist Church during Palm Sunday services (Survey Report). At right, the 2011 Joplin tornado leveled and partially swept away the Greenbriar Nursing Home. Of the approximately 90 residents and nurses in the building, 21 died. In November of 2005, a fast-moving nighttime tornado touched down near Evasnville, Indiana. Around 2am, the multi-vortex tornado struck the Eastbrook Mobile Home Park while most of the area’s residents were asleep. A total of 20 people were killed as the F3 tornado swept away mobile homes along the southern edge of the park. The event remains the deadliest tornado disaster in a mobile home park. In July of 1987, one of Canada’s deadliest tornadoes killed 15 people in the Evergreen Mobile Home Park in Edmonton, Alberta. Photogrammetry is a technique that allows for the measurement of debris movement in the visible portions of tornadoes. The highest officially calculated velocity using Fujita’s meticulous techniques was 284mph in the 1974 Parker City, Indiana, tornado (Forbes, Bluestein, 2001). The official analysis program ended in the 80’s, but rough calculations by Tom Grazulis indicated particle motions of 300mph just above ground-level in the 1995 Pampa, Texas, tornado (two vehicles are visible mid-air left of the funnel). Basic photogrammetry techniques indicate the 2007 Elie, Manitoba, tornado was of similar intensity (a van being thrown 200 yards from the tornado is visible at right). Since the the 70’s, the average amount of lead-time preceding a tornado has not changed significantly. As a result, the trend towards fewer fatalities has bottomed out. Urban sprawl and the increasing population in many severe weather-prone states will likely lead to an upturn in tornadoes causing 10 or more fatalities in the coming decades. Due to the random nature of all weather disasters, there is extreme variance in the number of deaths per year. Using a statistical bell curve of all tornado fatalities from 1980 to 2010, the 2011 tornado season’s death toll would have been expected less than once in a million years. In reality, a deadlier season is likely in the next century. 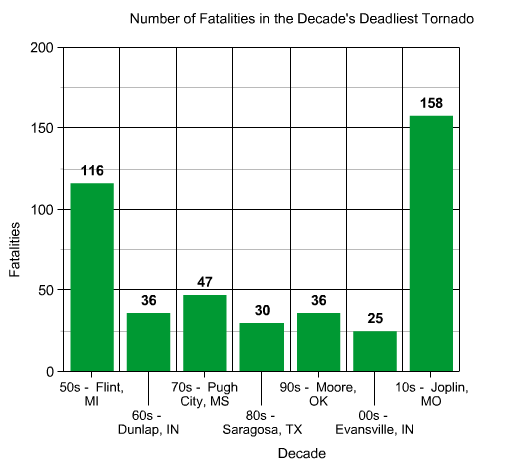 No single tornado caused more than 50 deaths between 1955 and 2011. After several widely visible and well-covered tornadoes (Xenia ’74, Wichita Falls ’79, Bridge Creek ’99) failed to cause more than 100 fatalities, it was considered by some an “impossibility” in the weather-radar age. In truth, major cities and crowded freeways open the possibility to a single storm causing more than 1,000 deaths.